Vincent Namatjira paints humorous portraits of important people. He is well known for his paintings of his great-grandfather, artist Albert Namatjira (1902–59), as well as his portraits of Queen Elizabeth II, Australian politicians and the US Presidents, Donald Trump and Barack Obama. Although the artist lives in a tiny and remote community in South Australia, his paintings show an awareness of how politics affects his life. 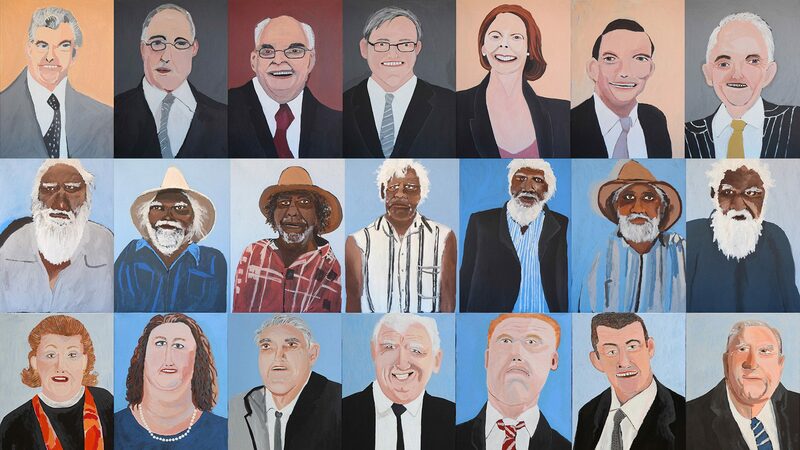 For APT9, Namatjira’s artworks include three groups of portraits of influential Australians. His first series depicts the seven Prime Ministers who have governed the country during the artist’s lifetime. The second series features the seven tjilpi (senior law men and leaders) of his community, and the third series is of the seven richest Australians. These portraits highlight issues of wealth, power and influence in Australian society. Find out the names of the people in the paintings, and find photographs of them. Can you match the names to the paintings? What characteristics of the people has the artist emphasised in the paintings? How does the video help you understand Namatjira’s portraits? Do you recognise anyone in these paintings? This is the first time that these three groups of portraits have been shown together. Imagine a conversation involving the people in these paintings. What would they say to each other? Vincent Namatjira’s series of portraits with Lisa Reihana’s characters in her video work. How do the artists make their characters recognisable? Create a blind continuous line drawing of someone you know or someone in the public eye. Fill in the shapes of your drawing with colour to create an abstract portrait. provoke discussion about 21st century issues and concerns? connect with the viewers experiences and/or expectations to construct meaning?